Last week’s post on “The records of death” — about the heartbreaking stories told of the 1906 Great Earthquake and fire in the records of what was then called the Coroner’s Office in San Francisco1 — raises a wonderful genealogical question. If those records, from before and after that disaster, survived for us to use today, what else did? And there’s a wonderful resource out there with the answers for anybody who’s interested in San Francisco research. 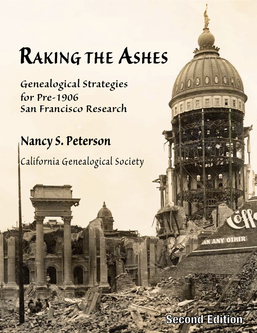 It’s a book called Raking The Ashes: Genealogical Strategies For Pre-1906 San Francisco Research,2 newly published in its second edition, and it’s an absolute necessity for your bookshelf if you’re looking at that place and time. Written by Nancy Simons Peterson, CG, the research director of the California Genealogical Society, this 242-page paperback takes the researcher through the issues of what did and didn’t survive, what workarounds exist for things that didn’t survive, what additional resources are available, and even what research techniques are particularly applicable to solving difficult problems of pre-1906 San Francisco. An appendix catalogs the availability of pre-earthquake newspapers. You can get your copy through the California Genealogical Society website (the information page is here and the order page is here), through the website for the book (here) or even through Amazon (here). I haven’t heard of this book before, but maybe I should get one. On my side there was no one in California until much later. However, on Tom’s side there is one brother of his gggrandfather who left Oregon for California in the late 1860’s “and was never heard from again” according to one family “researcher.” I searched for years and could never find him. Then one day, out of the blue, he turned up in a search as a voter registrant in San Francisco in 1870 and I verified that he actually went to Californi, that his middle name was Gibbs (which I had assumed was a good possibility because that was his mother’s maiden name and the middle initial was consistently “G.”) Many different birth dates have been attached to him but, for now, I’m assuming that he is the most likely to know his own year of birth which is on the record. While he may not have been still living at the time of the 1906 earthquake, it is certainly likely that some of his records might have been destroyed. It would be very helpful to know alternative places to find him. The cost of this book would be well worth it if I could find out a little more about him! Sounds like this might be just what you need, Mary Ann! Judy, thank you very much for shining a spotlight on Nancy’s book. Nancy has been a tireless volunteer for the California Genealogical Society and it is wonderful to see her work acknowledged. And a great big thank YOU to Nancy for writing the book and to the California Genealogical Society for publishing it!